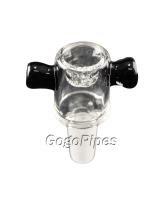 This is glass on glass 14mm Screen Bowl that is easy to hold and has built in screen. Comments: Better than the 20 dollar Illadelph bowl it replaced. Pros: This bowl is amazing because of the ice pinches. It allows for almost maximal draw out of your water pipe. You can pack a ton into this bowl and push it down to pack more; there will still be a great amount of airflow. I used this with a perc downstem and it created a smoking experience like no other. Cons: It's thin. I dropped it into my sink today and it broke in half where the bowl and "ring" were. Comments: More material snaps through into your piece. Be prepared to clean your water pipe more often. Lastly, I would buy this bowl again. I'm getting a replacement one after writing this!